WIFI, BIG, STONE FIREPLACE! CLOSE TO SKI, GOLF, WATERPARK, etc! 4 bedrooms. 2 bathrooms. Sleeps up to 12. This home, Poplar Cottage, is professionally managed by Massanutten Vacation, a local vacation rental home company. To book this home you need to complete one of our leases. We will send it to you once we have your home address, email address and cell phone number. 3 queen beds. 1 twin bed. 1 twin-over-double bunk bed. WIFI, BIG STONE FIREPLACE, VERY LONG DINING TABLE!!! Poplar Cottage is named for the tulip poplar trees that are all over the property. 2 decks! 4 bedrooms, big great room with a big stone fireplace, a very big dining room table for family meals & craft-making. Enjoy a warming fire (firewood is provided. Fireplace use is for Oct 1 to Mar 31st, only) while sharing meals with your family, watching TV, and just hanging out. * This home has a high chair for babies and toddlers. Enjoy the quietude of the neighborhood as dappled sunlight reaches through the poplar, hickory, maple and oak trees, birds sing and deer walk through the yard. The kitchen is stocked and the dining room table is huge. 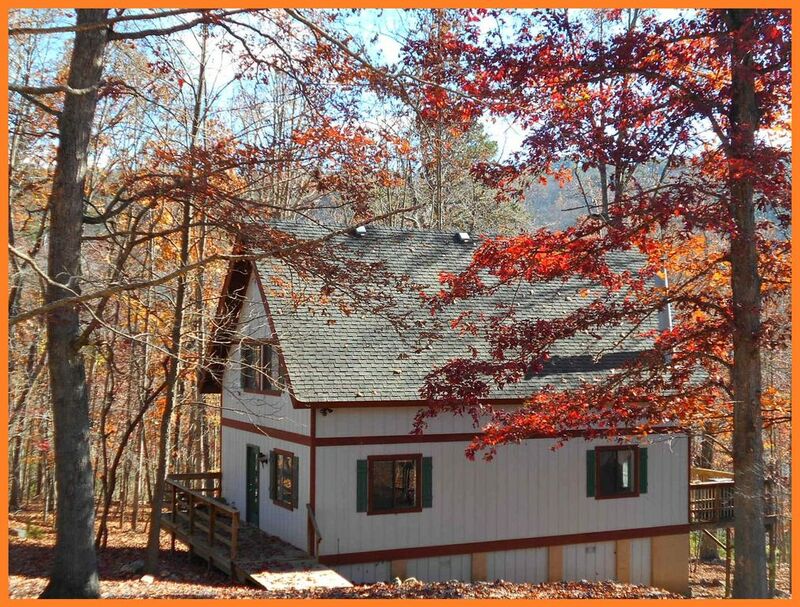 Bring your family for a peaceful and fun vacation in Poplar Cottage. This home is a quick walk to our Great Escape house- just 4 lots away! The scenic Overlook & hiking trails, and Mountain Greens Golf Course are also nearby. 10 minute drive to the water park. 5 minute drive to mini-golf, go-karts, outdoor swimming pool & the ski lodge. Enter the front door into a hallway. To your left is the laundry room, and a full bathroom with a tub/shower combo. To your right is a bedroom with a queen bed and cable TV. The great room (kitchen, dining room with a very big table, and the living room) is down the entry hall to the back of the home. The living room boasts a large stone fireplace, (wood is provided. Fireplace use 01 October through 31 March, ONLY), with a huge hearth, cable flat screen Vizio TV. The dining room table is MASSIVE, and there are plenty of chairs to seat everyone for meals. The deck is off the living/dining room. Upstairs are 3 bedrooms and a full bath with a tub/shower combo. Two of the bedrooms are at the front of the house: One bedroom has a pyramid bunk (twin over double) bed, and a twin bed. Another bedroom has a queen bed and cable TV. The 3rd upstairs bedroom is at the back of the house, and has a queen sleigh bed, cable TV, and it's own small deck. 2) A copy of your unexpired U.S. military ID card, current orders, or Veteran's Administration ID must be submitted BEFORE you make any payment to get this discount, since we are unable to deduct anything from the cost after your payment is made through HomeAway. Military discount will be applied once your military ID is received in our office. 5 minute drive to the slopes, mini-golf & go-karts! 1 minute to Mountain Greens Golf Course and Fareways Restaurant! 7-10 minutes to the water park! Tennis, Skiing, Snowboarding, Snow Tubing, Arboretum, Playgrounds, Go-Kart Track, Summer Tubing, Tennis, Golf, Miniature Golf, Fishing, Hiking, Biking, Horseback Riding, Water Park, Large Arcade Room, Skate Park, Dining. Guests must bring towels for pool & water park, bath & hand towels and wash cloths. Located on a quiet residential street in Massanutten Village. Linens for the beds are provided. The fireplace is to be used from Oct 1st through Mar 31st, only. Firewood is provided. Parking for 4 vehicles in the driveway. More may fit, depending on the sizes of the vehicles. Fireplace is in the living room. Living room has a sofa, love seat and an arm chair. Large open kitchen is stocked to cook, serve and eat all meals, together. Large farm dining table. There are 12 chairs in the house so all 12 of you can eat, together. The dining table is great for crafters, scrapbookers, etc! River trips can be booked through other companies, while you are here. Slopes are open beginning of December to mid March. There are 2 golf courses in Massanutten, and more outside the Massanutten area. The ground floor is wheelchair accessible. There is a ramp from the driveway to the front door. Ground floor has a bedroom, a full bathroom, kitchen, dining & living, and a large deck. Pool pass is issued, when signed for by guest. Pool pass admits up to 12 guests to the Stonewall Terrace outdoor pool from Memorial Day weekend through Labor Day weekend. Ask about details. The Stonewall Terrace outdoor swimming pool (open Summertime, only) is a short drive away! Couple of the TVs didn’t work , the living room was a little small for 8 people but we worked it out . Thank you for your review! We are so glad you enjoyed the house. We're sorry not all TVs worked. One of them does not have cable (as explained in the description), but the rest do. I’ve rented many homes from HomeAway and I’ve never been disappointed until now. They were lovely views outside the house but the window panes were so old that they were either stained or had condensation in between the window panes. I even tried to clean the windows so we could see outside. Many of the beds were hard and squeaked when you turned over waking up the person in the room with you. The pictures on HomeAway were deceiving the house looked a lot nicer than it actually was. It just didn’t meet our standards at all. For some families with young children it might be a good place to come and have a ski vacation as long as you know what your dealing with. We are so sorry you did not enjoy the house. If you had let us know, while you were here, we could have moved you to another of our homes. We hope you'll come stay with us, again. Power was out when we arrived and didn’t come back on until the next night. While this is considered an “act of God,” management responsible for the cabin did not seem to care that it was mid November and that we had no heat. Also Found roaches under the bed. Will not book a cabin through this company again. We are so sorry about the electric power being out when you arrived. If there had been some way we could have turned the power back on, we 100% would have. We do not like when ANY utility service is interrupted, and we understand the utility companies are responsible for restoring the service. Fortunately, that house has a huge stone fireplace and we supply the firewood. Once the fire is going it heats the whole house! Occasionally, once the house has been treated inside & out by pest control (as was the case in the beginning of November) some insects, like tree roaches (very different from German cockroaches), ants, and spiders will enter the house, cross the barrier of pesticide, then die. So, what you found is evidence the pest control worked. We hope you will give us another try and that everything is perfect for you, then! I was very disappointed in the overall quality of the house. The pictures made it appear to be in much better shape than is was. It had a little bit of a fraternity house feel. It was roomy just not well taken care of - holes in the walls, pieces missing from faucets, light bulb hanging down in refrigerator, hooks pulling away from the wall, and a headboard that moved when you sat down on the bed. This is not a place we will rent again. When we picked up the keys and dropped them off there was no one on site to talk to either. This house was fine for a weekend away, but it definitely needs some work. Most of the other reviews are spot on. There is mold in the bathrooms. The doors don’t close right and has a mildew smell. The house was comfortable once the air was on. The kitchen has what you need and the area is very quiet and pretty. House was clean and spacious! Would stay again and would recommend! 20 minutes from Skyline Drive, the city of Harrisonburg and James Madison University. 45 minutes from Luray Caverns, Charlottesville and the University of Virginia. 2 hours from Washington DC and Richmond VA. IMPORTANT: When you send a Reservation Request to us and we accept it, the credit card you gave to HomeAway/VRBO will be charged their service fee and our applicable fees ($200 non-refundable down payment if you will be arriving in more than one month from the date your Reservation Request is made, OR the total amount- rental fee (this includes the $200 non-refundable down payment), tax, cleaning fee, and refundable damage deposit). The $200 non-refundable down payment is not the damage deposit. After we accept your Reservation Request we will email your lease to you. You will have 48 hours to complete and return it to us. If you do not return it to us in time the booking will be cancelled and you will forfeit the $200 non-refundable down payment. HomeAway/VRBO are the decision makers about whether they will refund the service fee. Holiday periods require a 3-night minimum booking at the holiday rate.